21 November 1889: opening of the Kabukiza, built in Tôkyô in the district of Kobiki-chô (Ginza). July 1892: premiere at the Kabukiza of the dance "Makura Jidô", which starred Onoe Kikugorô V in the role of Kikujidô. October 1892: premiere at the Kabukiza of the matsubamemono "Suô Otoshi", starring Ichikawa Danjûrô IX and Nakamura Fukusuke IV in the roles of Tarôkaja and the Princess. March 1893: premiere at the Kabukiza of Fukuchi Ôchi's Nagauta-based dance "Shunkyô Kagami Jishi". The musical accompaniment was written by Kineya Shôjirô III, the choreography was made by Fujima Kan'emon II and the leading role was played by Ichikawa Danjûrô IX. His two daughters played the roles of the butterflies. May 1901: Nakamura Fukusuke IV took the name of Nakamura Shikan V at the Kabukiza. November 1911: Nakamura Shikan V took the name of Nakamura Utaemon V at the Kabukiza. November 1912: première at the Kabukiza of Enomoto Torahiko's drama "Meikô Kakiemon". The leading role of Kakiemon, the Bernard Palissy of Japan, was played by Kataoka Nizaemon XI. April 1916: Nakamura Kotarô II took the name of Nakamura Fukusuke V at the Kabukiza. October 1918: Ichikawa Yaozô VII and Ichikawa Matsuo I respectively took the names of Ichikawa Chûsha VII and Ichikawa Yaozô VIII at the Kabukiza. October 1921: premiere at the Kabukiza of Okamoto Kidô's drama "Ôsakajô". The leading role of Lady Yodo (Yodogimi) was played by Nakamura Utaemon V.
30 October 1921: the Kabukiza was burnt to the ground in a fire caused by an electrical short circuit. 1 September 1923 (11:58 AM): Tôkyô was destroyed by a powerful earthquake called Kantô Daijishin, which killed more than 200,000 people; the Kabukiza was burnt to ashes. April 1926: premiere at the Kabukiza of Matsui Shôô's drama "Yodogimi Odawara Jin". The leading role of Lady Yodo (Yodogimi) was played by Nakamura Utaemon V.
June 1928: premiere at the Kabukiza of Okamura Shikô's dance-drama "Maboroshi Wankyû", starring Onoe Kikugorô VI in the role of Wan'ya Kyûbê. September 1928: premiere at the Kabukiza of Kimura Tomiko's Tokiwazu-based dance "Koma", with a choreography and a musical accompaniment made by Hanayagi Jusuke II and Tokiwazu Mojibê III; the leading role was played by Ichikawa Ennosuke II. June 1929: revival at the Kabukiza of the dance "Gannin Bôzu", which was premiered in the 3rd lunar month of 1811 by Bandô Mitsugorô III. It was staged under the title "Ukare Bôzu". The role of the bonze look-alike beggar was played by the star Onoe Kikugorô VI, who used a different musical accompaniment, written by Kiyomoto Enjudayû V.
April 1939: premiere at the Kabukiza of "Fushimi Shumokumachi", the fourth play of Mayama Seika's cycle "Genroku Chûshingura". May 1940: Ichikawa Komazô IX took the name of Ichikawa Ebizô IX at the Kabukiza, playing the role of role of a uirô peddler, in reality Soga Gorô Tokimune in disguise, in the drama "Uirô Uri", which was revived for this occasion. 10 March 1945 (00:08 AM): 344 US Army B29 bombers dropped 2,000 tons of bombs on Tôkyô, killing more than 120,000 people and destroying almost everything; the Kabukiza was burnt to ashes. January 1951: the Kabukiza reopened. April 1951: Nakamura Shikan VI took the name of Nakamura Utaemon VI at the Kabukiza. July 1951: Ichikawa Jukai III, Ichikawa Sumizô VII and Ichikawa Raizô VIII celebrated their shûmei in Tôkyô at the Kabukiza. June 1953: Ichikawa Yaozô VIII and Matsumoto Komagorô I respectively took the names of Ichikawa Chûsha VIII and Ichikawa Yaozô IX at the Kabukiza. September 1953: Sawamura Tosshô IV and his son Sawamura Genpei VI respectively took the names of Sawamura Sôjûrô VIII and Sawamura Tosshô V at the Kabukiza. July 1955: Kataoka Roen V took the name of Kataoka Gadô V at the Kabukiza. October 1955: Bandô Hikosaburô VII took the name of Ichimura Uzaemon XVII at the Kabukiza. September 1956: revival at the Kabukiza of the Kiyomoto version of the dance "Takao Zange" in which Nakamura Utaemon VI played the role of the ghost of the keisei Takao. April 1962: Ichikawa Ebizô IX took the name of Ichikawa Danjûrô XI at the Kabukiza. September 1962: great shûmei at the Kabukiza for 3 generations of actors belonging to the Yamatoya guild (Yamatoya Sandai Shûmei); Bandô Minosuke VI took the name of Bandô Mitsugorô VIII, Bandô Yasosuke IV became Bandô Minosuke VII and Bandô Yasosuke V made his first appearance on stage. May 1963: great shûmei at the Kabukiza for the Omodakaya guild; Ichikawa Ennosuke II, Ichikawa Danko III and Ichikawa Kamejirô I respectively took the names of Ichikawa En'ô I, Ichikawa Ennosuke III and Ichikawa Danko IV. April 1964: Sawamura Yoshijirô IV and his father Sawamura Tanosuke V respectively took the names of Sawamura Tanosuke VI and Sawamura Shozan III at the Kabukiza. September 1964: great shûmei at the Kabukiza for the Kyôya and Akashiya guilds; Ôtani Tomoemon VII, Ôtani Hirotarô II and Ôtani Hiromatsu I respectively took the names of Nakamura Jakuemon IV, Ôtani Tomoemon VIII and Nakamura Shibajaku VII. May 1965: shûmei at the Kabukiza for 3 young actors of the Otowaya guild; Onoe Ushinosuke V, Bandô Kamesaburô IV and Onoe Sakon I respectively took the names of Onoe Kikunosuke IV, Bandô Shinsui VIII, and Onoe Tatsunosuke I.
April 1967: great shûmei at the Kabukiza for the Narikomaya and Kagaya guilds; Nakamura Fukusuke VII, Kagaya Fukunosuke II, Kagaya Hashinosuke II and Nakamura Tamatarô III respectively took the names of Nakamura Shikan VII, Nakamura Fukusuke VIII, Nakamura Matsue V and Nakamura Tôzô VI; Shikan's son Nakamura Kotarô V made his first stage appearance. May 1969: Ichikawa Danko IV took the name of Ichikawa Danshirô IV at the Kabukiza. November 1969: Ichikawa Shinnosuke VI took the name of Ichikawa Ebizô X at the Kabukiza. May 1972: Bandô Shinsui VIII and Ichimura Takematsu V respectively took the name of Bandô Kamezô II and Ichimura Manjirô II at the Kabukiza. September 1972: Ichimura Takenojô VI took the prestigious name of Nakamura Tomijûrô V at the Kabukiza. October 1973: Onoe Kikunosuke IV took the name of Onoe Kikugorô VII at the Kabukiza. September 1976: Sawamura Tosshô V took the name of Sawamura Sôjûrô IX at the Kabukiza. February 1979: Ichikawa Omezô V took the name of Ichikawa Sadanji IV at the Kabukiza. February 1980: Bandô Kamezô II took the name of Bandô Hikosaburô VIII at the Kabukiza. June 1981: great shûmei at the Kabukiza for the Yorozuya guild; Nakamura Yonekichi IV, Nakamura Baishi III, Nakamura Mitsuteru and Ogawa Mikihiro respectively took the names of Nakamura Karoku V, Nakamura Tokizô V, Nakamura Kashô III and Nakamura Shidô II. October 1981: great shûmei at the Kabukiza for 3 generations of actors belonging to the Kôraiya guild (Kôraiya Sandai Shûmei); Matsumoto Kôshirô VIII, Ichikawa Somegorô VI, Matsumoto Kintarô III, Ichikawa Nakanosuke III and Ichikawa Momomaru respectively took the names of Matsumoto Hakuô, Matsumoto Kôshirô IX, Ichikawa Somegorô VII, Matsumoto Kôemon and Ichikawa Shinsha II. April 1985: Ichikawa Ebizô X took the name of Ichikawa Danjûrô XII at the Kabukiza. November 1990: Nakamura Senjaku II took the name of Nakamura Ganjirô III at the Kabukiza. April 1992: Nakamura Fukusuke VIII and Nakamura Kotarô V respectively took the names of Nakamura Baigyoku IV and Nakamura Fukusuke IX at the Kabukiza. May 1996: Onoe Ushinosuke VI took the name of Onoe Kikunosuke V at the Kabukiza. January 1998: Kataoka Takao took the name of Kataoka Nizaemon XV at the Kabukiza. January 2001: Bandô Yasosuke V took the name of Bandô Mitsugorô X at the Kabukiza. April 2002: Nakamura Matsue V took the name of Nakamura Kaishun II at the Kabukiza. May 2002: Onoe Tatsunosuke II took the name of Onoe Shôroku IV at the Kabukiza. May 2003: Bandô Shônosuke, Kataoka Jûzô VI and Ichikawa Otora VI respectively took the names of Kawarasaki Gonjûrô IV, Kataoka Ichizô VI and Ichikawa Omezô VI at the Kabukiza. May 2004: Ichikawa Shinnosuke VII took the name of Ichikawa Ebizô XI at the Kabukiza. March 2005: Nakamura Kankurô V took the name of Nakamura Kanzaburô XVIII at the Kabukiza. April 2007: Nakamura Shinjirô took the name of Nakamura Kinnosuke II at the Kabukiza. November 2008: official announcement about the future of the Kabukiza, the main Kabuki theater in Japan. Destruction from May 2010 and rebuilding on the current site, in the Eastern part of the Ginza district of Tôkyô. The rebuilding was expected to take at least three years. To celebrate the closing of this prestigious theater, a series of performances entitled Kabukiza Sayonara Kôen (Kabukiza Farewell Performances) were scheduled to be held from January 2009 to April 2010. Up to the reopening ceremony, monthly Kabuki performances were reported as being staged at the Shinbashi Enbujô. January 2009: 1st of the 16 Kabukiza Sayonara Kôen (Kabukiza Farewell Performances) [more details]. February 2009: 2nd of the 16 Kabukiza Sayonara Kôen (Kabukiza Farewell Performances) [more details]. March 2009: 3rd of the 16 Kabukiza Sayonara Kôen (Kabukiza Farewell Performances) [more details]. April 2009: 4th of the 16 Kabukiza Sayonara Kôen (Kabukiza Farewell Performances) [more details]. May 2009: 5th of the 16 Kabukiza Sayonara Kôen (Kabukiza Farewell Performances) [more details]. June 2009: 6th of the 16 Kabukiza Sayonara Kôen (Kabukiza Farewell Performances); isse ichidai performance of Kataoka Nizaemon in the role of Yohei in Chikamatsu Monzaemon's masterpiece "Abura no Jigoku" and the hatsubutai of Matsumoto Kôshirô's grandson Matsumoto Kintarô IV [more details]. July 2009: 7th of the 16 Kabukiza Sayonara Kôen (Kabukiza Farewell Performances) [more details]. August 2009: 8th of the 16 Kabukiza Sayonara Kôen (Kabukiza Farewell Performances) [more details]. September 2009: 9th of the 16 Kabukiza Sayonara Kôen (Kabukiza Farewell Performances) [more details]. October 2009: 10th of the 16 Kabukiza Sayonara Kôen (Kabukiza Farewell Performances) [more details]. November 2009: 11th of the 16 Kabukiza Sayonara Kôen (Kabukiza Farewell Performances) [more details]. December 2009: 12th of the 16 Kabukiza Sayonara Kôen (Kabukiza Farewell Performances) [more details]. January 2010: 13th of the 16 Kabukiza Sayonara Kôen (Kabukiza Farewell Performances) [more details]. March 2010: 15th of the 16 Kabukiza Sayonara Kôen (Kabukiza Farewell Performances) [more details]. April 2010: final Kabukiza Sayonara Kôen (Kabukiza Farewell Performances) [more details]. 30th April 2010: Kabukiza closing Ceremony [more details]. 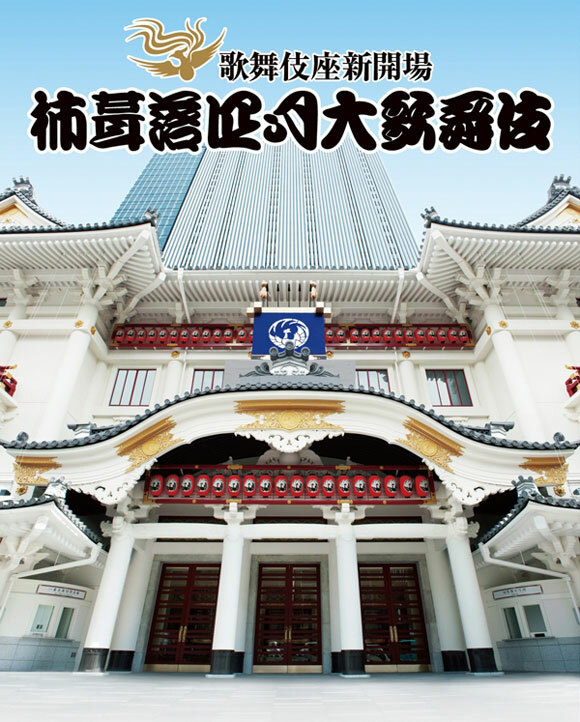 May 2010 ~ Spring 2013: destruction of the 4th Kabukiza; building of the 5th Kabukiza. 28th March 2013: traditional ceremonial hand-clapping (koshiki kaomise tejimeshiki in Japanese; the traditional face-showing ritual of hand-clapping) with all actors and Kabuki-related people on the brand-new stage for the successful opening of the 5th Kabukiza. April 2013: 1st of the 12 Kokera Otoshi Ôkabuki (Opening Ceremony Grand Kabuki Performances) [more details]. May 2013: 2nd of the 12 Kokera Otoshi Ôkabuki (Opening Ceremony Grand Kabuki Performances) [more details]. June 2013: 3rd of the 12 Kokera Otoshi Ôkabuki (Opening Ceremony Grand Kabuki Performances) [more details]. July 2013: 4th of the 12 Kokera Otoshi Ôkabuki (Opening Ceremony Grand Kabuki Performances) [more details]. August 2013: 5th of the 12 Kokera Otoshi Ôkabuki (Opening Ceremony Grand Kabuki Performances) and and 21st edition of the Hachigatsu Nôryô Kabuki (literally "the August cool-breeze Kabuki"), a summer program which features a group of popular young stars in three short programs of Kabuki to fight the heat of summer [more details]. September 2013: 6th of the 12 Kokera Otoshi Ôkabuki (Opening Ceremony Grand Kabuki Performances) [more details]. October 2013: 7th of the 12 Kokera Otoshi Ôkabuki (Opening Ceremony Grand Kabuki Performances) [more details]. November 2013: 8th of the 12 Kokera Otoshi Ôkabuki (Opening Ceremony Grand Kabuki Performances), which celebrated the promotion to the first league of Kabuki actors ("kanbu shôshin") for two veterans, Arashi Kitsusaburô and Kataoka Matsunosuke [more details]. December 2013: 9th of the 12 Kokera Otoshi Ôkabuki (Opening Ceremony Grand Kabuki Performances) [more details]. February 2014: revival at the Kabukiza of Tsuruya Nanboku IV's drama "Kokoro no Nazo Toketa Iroito" [more details]. April 2015: Nakamura Ganjirô IV celebrated his shûmei in Tôkyô at the Kabukiza [more details]. March 2016: Nakamura Shibajaku VII took the name of Nakamura Jakuemon V at the Kabukiza [more details]. October 2016: important shûmei for the Narikomaya guild; Nakamura Hashinosuke III and his three sons Nakamura Kunio, Nakamura Muneo and Nakamura Yoshio take at the Kabukiza the names of Nakamura Shikan VIII, Nakamura Hashinosuke IV, Nakamura Fukunosuke III and Nakamura Utanosuke IV [more details]. November 2016: Nakamura Shikan VIII, Nakamura Hashinosuke IV, Nakamura Fukunosuke III and Nakamura Utanosuke IV celebrated their second month of shûmei at the Kabukiza [more details]. February 2017: debut on stage (hatsubutai) at the Kabukiza for Nakamura Kantarô III and Nakamura Chôzaburô II [more details]. May 2017: 3-generation shûmei for the Bandô branch of the Otowaya guild at the Kabukiza; Bandô Hikosaburô VIII, his two sons Bandô Kamesaburô V and Bandô Kametoshi respectively take the names of Bandô Rakuzen, Bandô Hikosaburô IX and Bandô Kamezô III. There is also the hatsubutai of Rakuzen's grandson Bandô Kamesaburô VI. Terajima Mahoro, the grandson of Living National Treasure Onoe Kikugorô and son of the actress Terajima Shinobu makes his first stage appearance (omemie). Moreover, the 22nd and 16th anniversaries (23rd and 17th memorial services) of the passing away of Onoe Baikô VII and Ichimura Uzaemon XVII are commemorated [more details]. January 2018: great name-taking ceremony at the Kabukiza for 3 generations of actors belonging to the Kôraiya guild (Kôraiya Sandai Shûmei); Matsumoto Kôshirô IX, his son Ichikawa Somegorô VII and his grandson Matsumoto Kintarô IV took the names of Matsumoto Hakuô II, Matsumoto Kôshirô X and Ichikawa Somegorô VIII at the Kabukiza [more details]. February 2018: second month of shûmei at the Kabukiza for Matsumoto Hakuô II, Matsumoto Kôshirô X and Ichikawa Somegorô VIII [more details].